Memorial Day is a time to remember. It is a day on the calendar that is set aside to honor those who have given their lives in service to their country. Many of these men and women volunteered to place themselves in harm’s way in order to save lives, protect their fellow Americans and others who were endangered, and to preserve and extend human freedom and dignity. Others who died in service to this nation were drafted, yet their sacrifice was no less honorable that those who went to the recruiting station and signed up. The shedding of blood for one’s country is truly worth remembering. 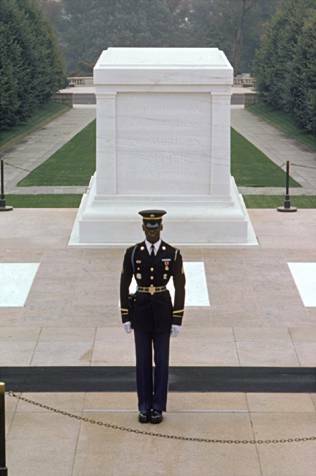 A number of years ago I traveled with a group of students to Arlington National Cemetery to witness the changing of the guard in front of the Tomb of the Unknown Soldier. At one point prior to the changing ceremony some of those sitting and watching became a little boisterous (I’m glad to say it wasn’t our group). Abruptly one of the Guards of Honor stopped his pacing and turned to speak toward the noisy group. With words that were firm and direct, he reminded the assembled group of the solemnness of that place and the proper respect that is to be shown. It was a startling but effective and necessary act. As I sit and think of that day and of the untold sacrifices made on behalf of this nation by so many, I fear the attitude of those few disruptive children may be a sad reflection of the attitude of many toward our national celebration of Memorial Day. It is not that we shouldn’t have a cook-out, go to Grandma’s house, or take our first dip in the pool for the season. One of the reasons that our service men and women died for was that we might have the freedom and ability to have enjoyment in life. I hope that you enjoyed your Memorial Day, but I hope you also remembered why it is on the calendar in the first place. As I close, three words come to my mind as I reflect on Memorial Day: Bravery, Sacrifice and Honor. These are the words that best reflect the vast majority of those who served or have served in the United States Armed Services. I am grateful for those who gave their lives for a cause greater than themselves, and I pray their families might find peace. I am grateful for those who served and came home to their families and friends. Some of them returned and were able to readjust and get on with life. Others have struggled because of the physical or emotional traumas they experienced. I pray that we as a nation will honor their sacrifices and support them and their families as they continue to fight battles on a different front.